As the seemingly endless line of saffron-clad men walked past us, many smiled and waved. I lifted my camera just as one of them aimed his iPhone at me. This micro-moment mirrored one that Tom and I have experienced repeatedly through our travels in India. It seems no matter where we go, we are invited into the world of Indian photo ops and selfies. 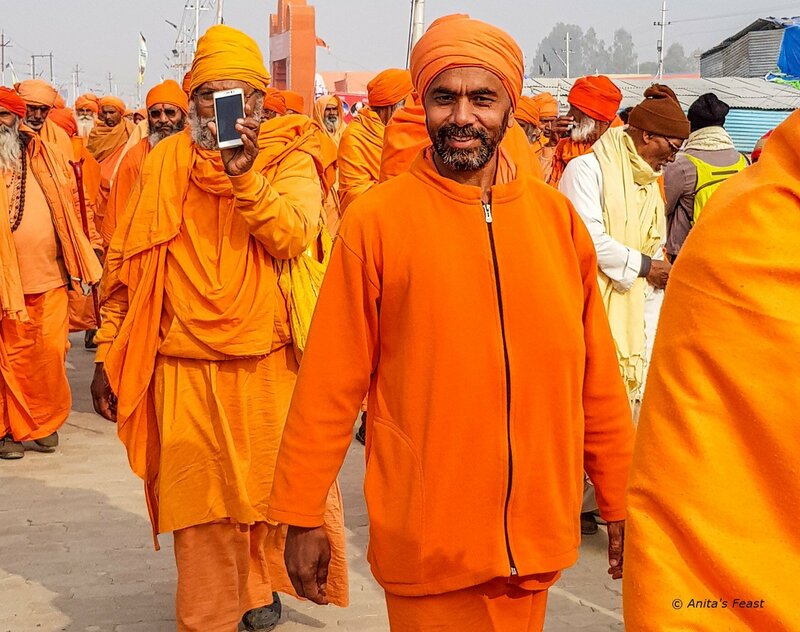 At Kumbh Mela 2019, we really were living in a microcosm of India, telescoped into 50 days and 150 million people. That’s some microcosm. The Kumbh Mela (festival of the sacred pitcher), the world’s largest public gathering, has been held at regular intervals for centuries, attracting the Hindu faithful to four holy locations in India. In recent years, devotees have been joined by spiritual tourists from around the world, as well as increasing numbers of the simply curious. This year’s edition is being held in Prayagraj (formerly Allahabad), Utter Pradesh from 4 January to 4 March. There, the goal for Hindu devotees is a holy dip in the sangam—the confluence of the Ganges, Yamuna, and the mythical Saraswati rivers. 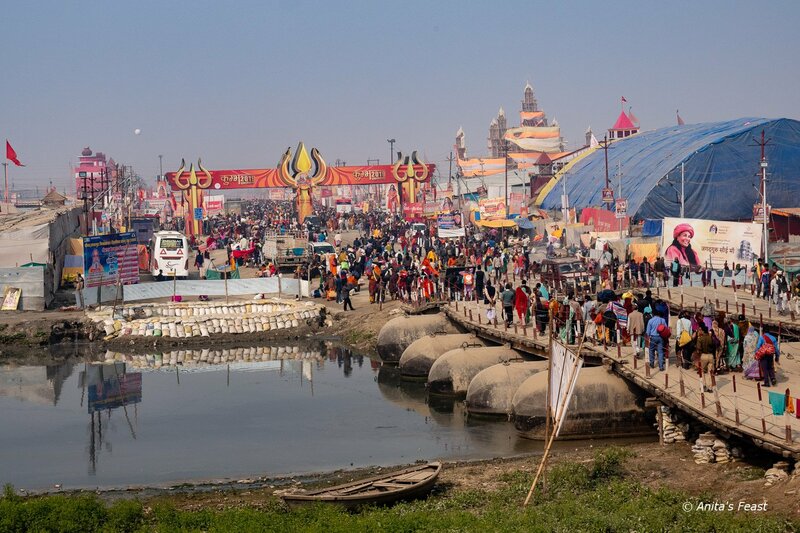 Tom and I had the privilege to attend Kumbh Mela 2019 as guests of Uttar Pradesh Tourism, The Times of India, and Lonely Planet Magazine India. It was an extraordinary experience, to say the least! Kumbh Mela takes participants back to an age of nature worship, with reverence for the fundamental elements of existence: water, fire, earth, sky, and wind. Its rituals reconnect with ancient traditions and evoke humankind’s need for connectedness. 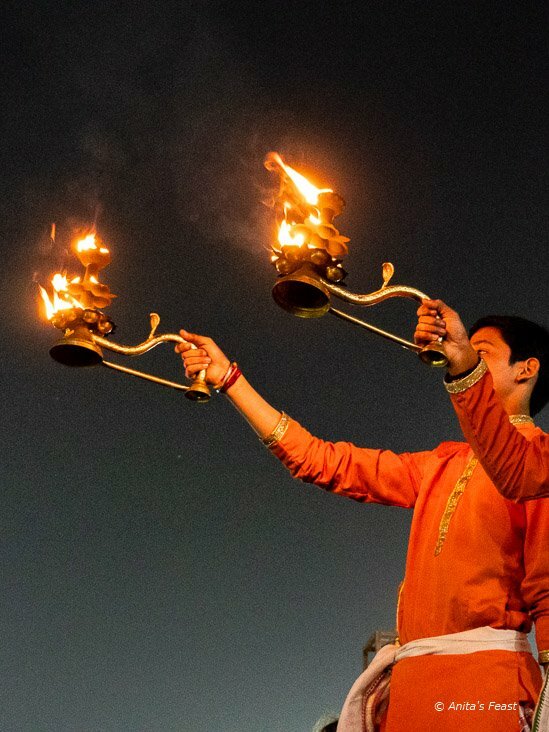 The gathering rotates between four locations in India, each of them sacred because of their connection to Hindu mythology. 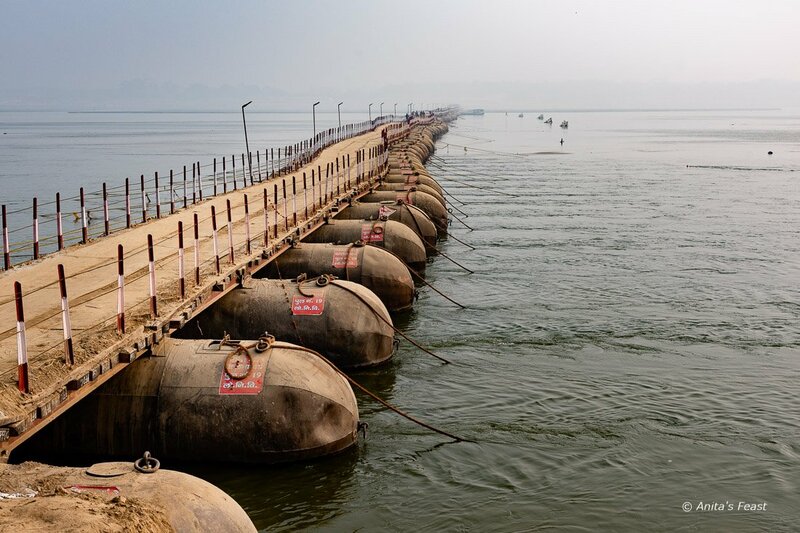 The pilgrims who bathe at the sangam are expected to sacrifice, according to their capacities, their wealth and material possessions, personal comfort and interpersonal differences. 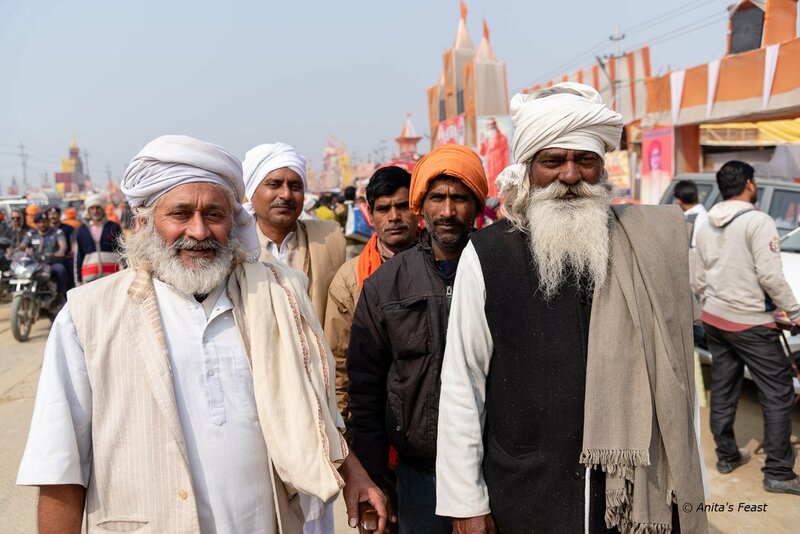 A religious mela, or public gathering such as Kumbh, is a great equalizer: Hindu women and men participate equally, irrespective of their age, class or origin. People of all faiths, and no faith at all, are welcomed. 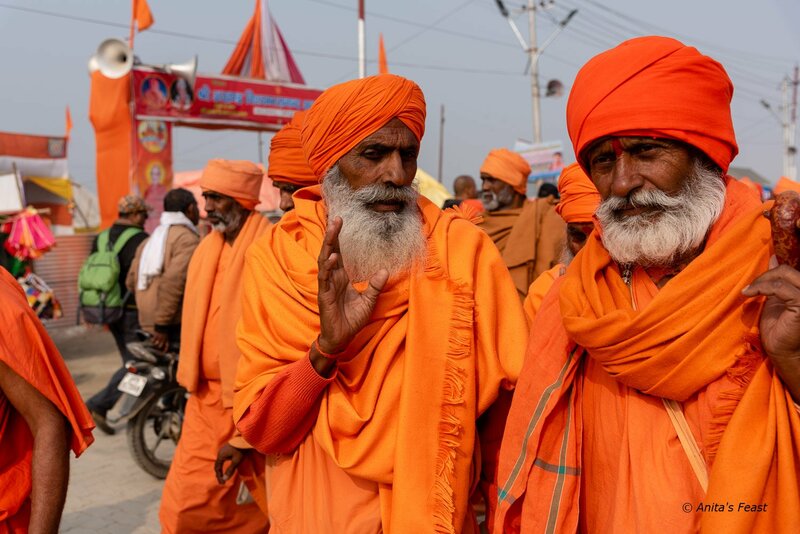 The color palette for Kumbh is definitely saffron! Roads were packed en route to Prayagraj, with devout pilgrims traveling by every mode of transport imaginable, including on foot. We rode in the comparative comfort of coaches, but our journey from Varanasi took nine hours instead of the customary four and one-half. New flyovers built around Prayagraj provided a sunset view of Sangam City, its tents sprawling to the horizon. The city was a model of cleanliness and sanitation for a gathering of such magnitude. Inside its perimeters, temporary roads and pontoon bridges connected the “neighborhoods” of Kumbh Mela. Besides all the places of worship, streets were lined with the necessities of daily living, including food stalls and even shops selling cookware. As Kumbh is a family journey for many, there were entertainment for children and amusement park rides, as well. And 122,500 toilets. We shared the pilgrim’s path to sangam with more than 35 million fellow humans for the most auspicious bathing day, 4 February. It is believed that by taking a ceremonial dip in the holy river on this day one attains moksha, liberation from the cycle of life, death and rebirth—a key precept of Hinduism. How could so many people gather in one place, shelter in close proximity and retain a sense of order, purpose, and even good humor? Although we were not at Kumbh for a holy dip, it was impossible not to be swept up in its convivial, welcoming atmosphere. 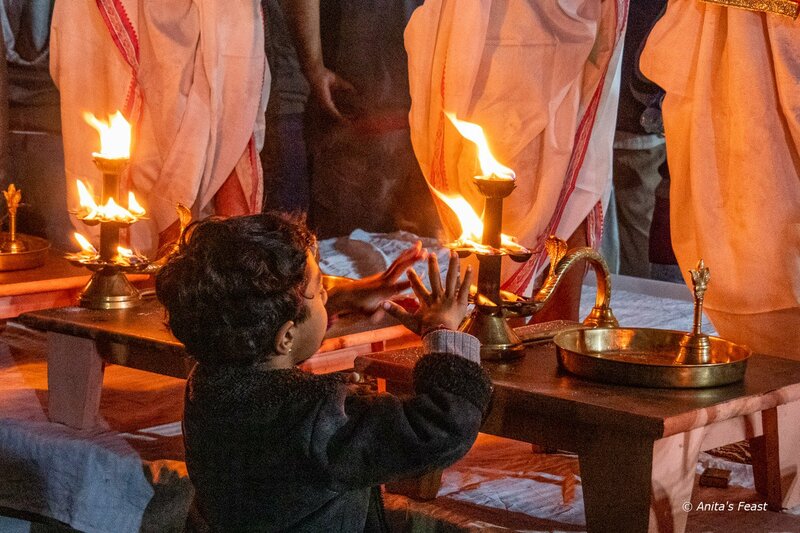 Our brief encounter with a centuries-long tradition gave us a glimpse into a spiritual journey that every devout Hindu yearns to make at least once in a lifetime. 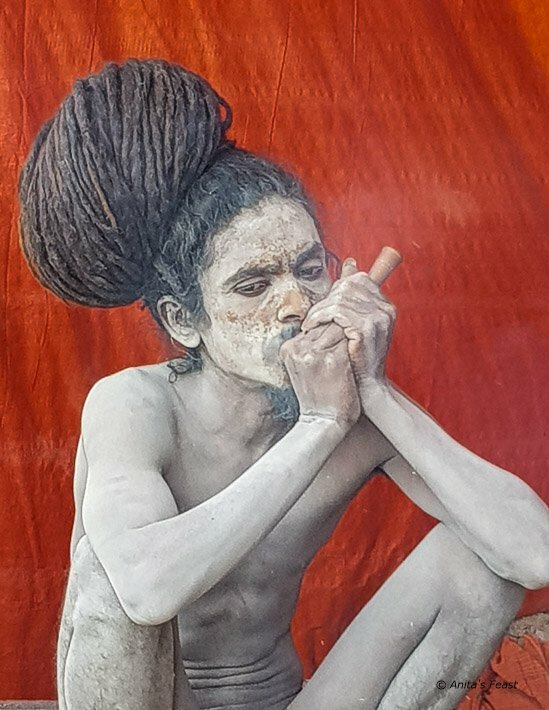 To many people, Naga sadhus—holy men dressed only in mud, ash, and beads—are the iconic faces of Kumbh. 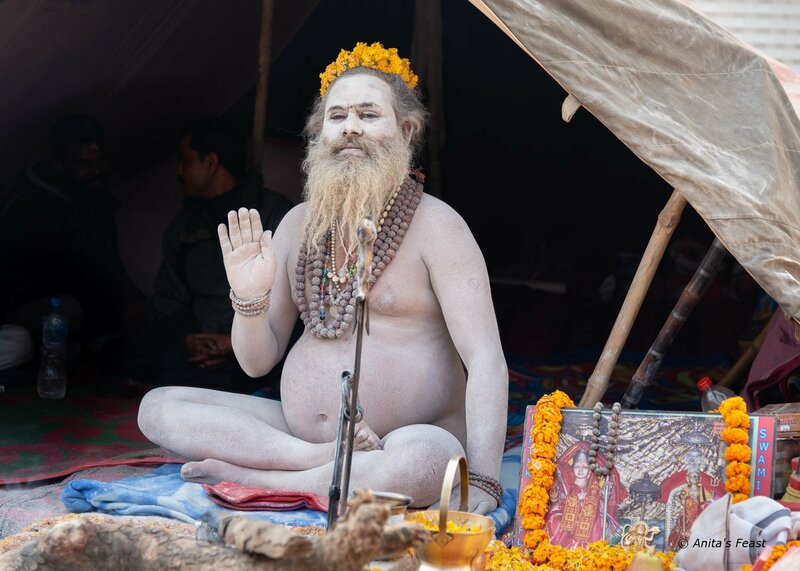 These ascetics live a hermetic life but travel from their mountain retreats in the Himalayas to join the millions gathered for a holy dip during Kumbh Mela. In addition to mud and ash, Naga sadhus sport a variety of adornments and many wear dreadlocks. The Naga sadhus are given priority to enter the water on auspicious bathing days. At other times, they welcome meetings with pilgrims and offer blessings to Hindu devotees. Normally photo-averse, at Kumbh Mela, some of them pose for photographs upon request—and a donation. 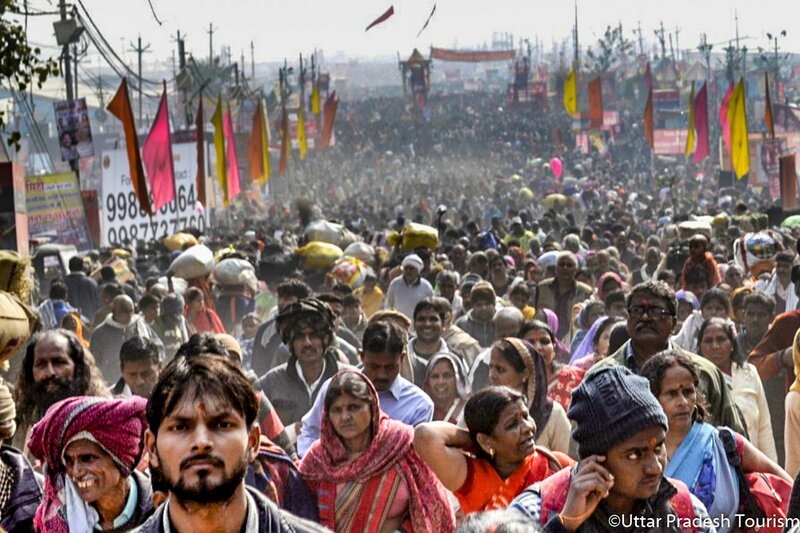 Kumbh is a living city, its citizens transitory. We found the atmosphere, and especially the behavior of mind-boggling crowds, to be genuine, friendly, and tolerant. We were welcomed by attendees, from sadhus traveling in groups to families and individuals from all over. Many pilgrims carry their belongings, including bedding and cooking supplies with them, as they go about their day and their devotions. Others set up camp in designated areas or stay in nearby Prayagraj for a week or a month or more, turning the journey into a family holiday. Within the temporary city, bathing, cooking, and doing the wash are just a few of the many daily activities carried out at the Mela in the company of family, friends, and strangers. 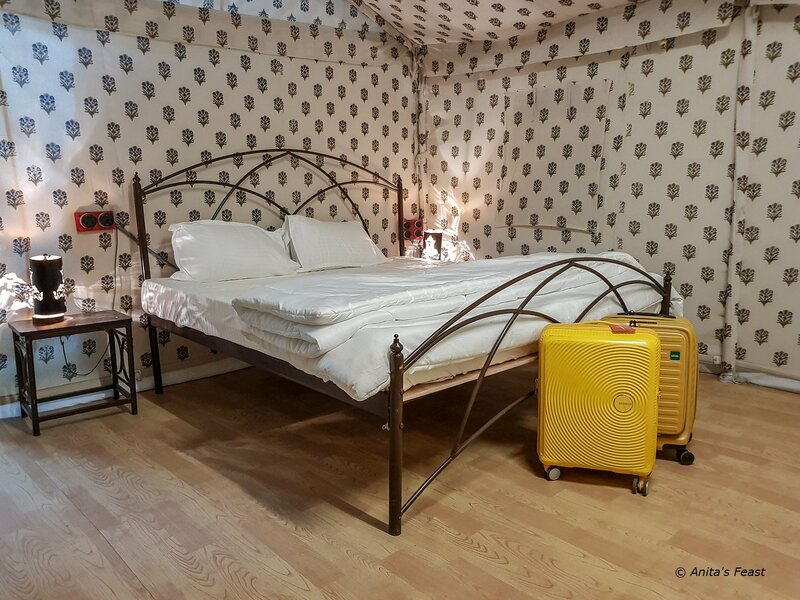 Our home at Kumbh was a tent with en suite bathroom at Indraprastham, a ‘luxury’ tented camp erected for attendees with means. Indian families we met in the dining tent shared with us their excitement to be at Kumbh, and how much the holy dip means to them. 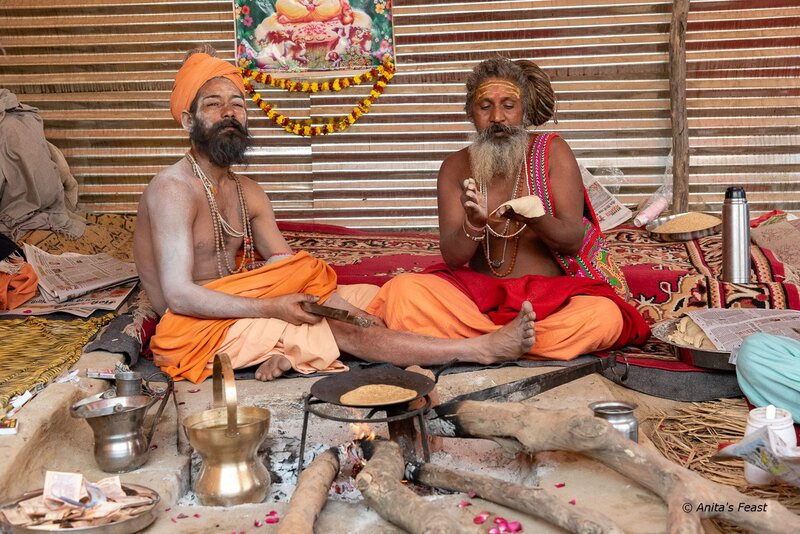 Making roti and tea…even sadhus have to eat! 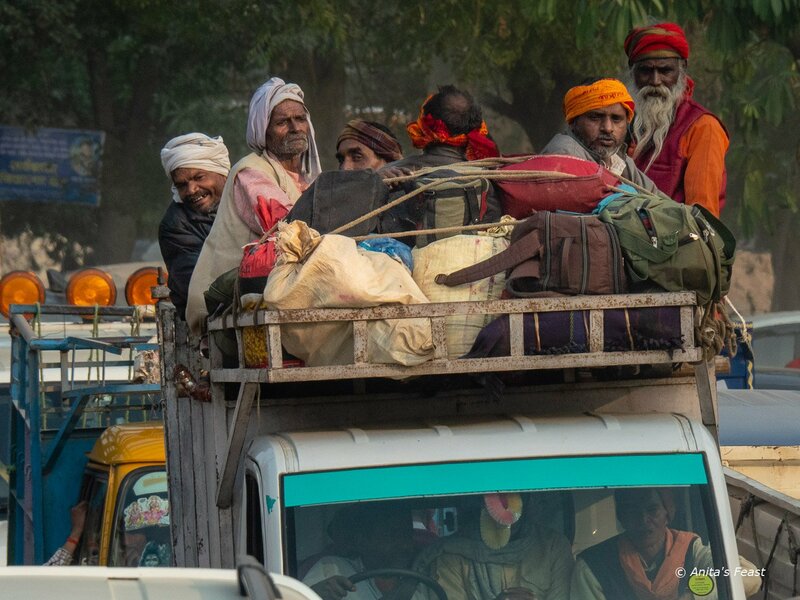 Like us, these pilgrims had traveled to Prayagraj from Varanasi. Everyone participates in Kumbh rituals such as morning and evening prayers to Mother Ganga. As non-Hindus, Tom and I had little context for understanding the sights around us. 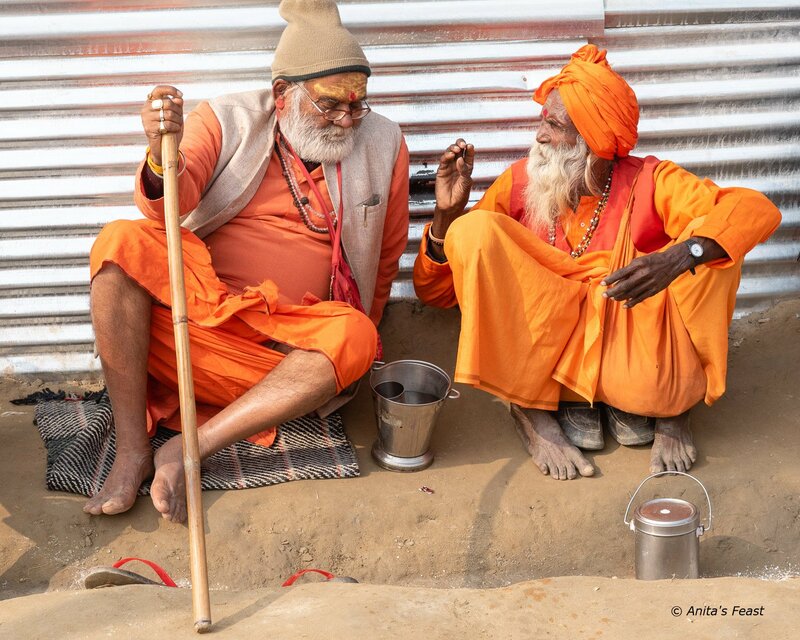 For more about Kumbh Mela—and great photos too!—we suggest a look at what Ami Bhat has to say on Thrilling Travel. Many thanks to our hosts—Uttar Pradesh Tourism, The Times of India, and Lonely Planet Magazine India—for an amazing week. Thanks too, to India Someday and Experience Varanasi for chasing the ever-changing logistics of Kumbh Mela, surely a daunting task! Wow. That’s is one whole helluva lot of humanity in one place! I can see the attraction of the Kumbh Mela from a cultural perspective but I would definitely want to prepare myself for that kind of crowd. I wonder about the culture shock for those of us not used to it. I guess I would need to pack extra patience! 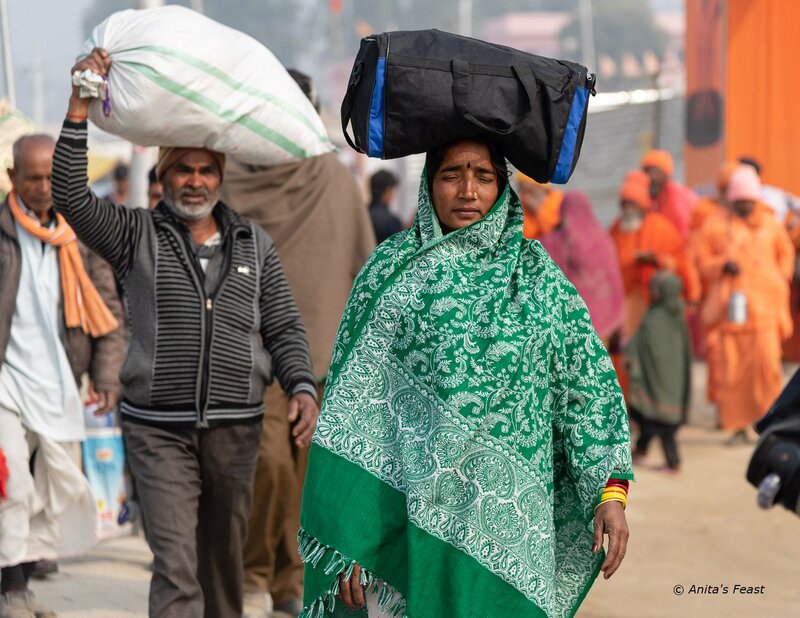 In India, patience comes in handy, but we found that the most important thing to pack for an event like Kumbh is probably an open mind. 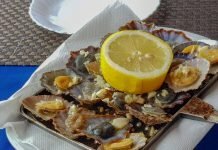 We too worried about the crowds beforehand, but thankfully, people we met were welcoming, and Lonely Planet and UP Tourism took good care of us. It was a marvelous experience! What wonderful photography and how brave you were to immerse yourself in such a mass of humanity. Thank you Irene! India provides a traveler with many opportunities to step outside one’s comfort zone. In this case, as always, we are so glad we did! Although it seems daunting, we are fascinated by India. There is so much going on in one place with crowd sizes of devotees that are alien to Westerners. But if we decide to immerse ourselves, the Kumbh Mela just might be a good place to start. 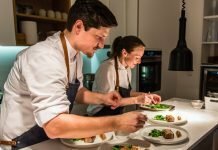 Great comprehensive article and love the photos.